It’s hard not to complain about the quality of the products or services provided by a company, especially when they fail to meet the expectations set for us. 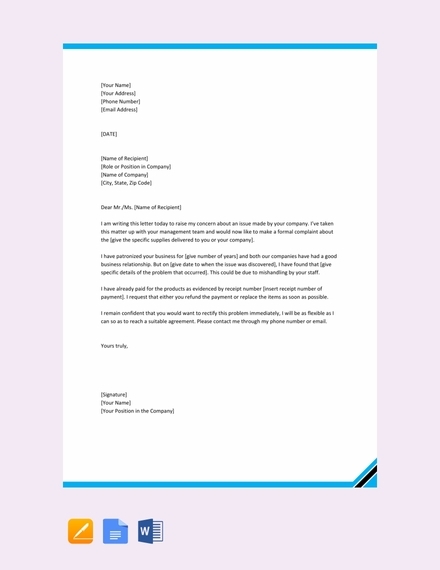 But as much as we want to control ourselves from making everything a big deal, businesses often encourage consumers to forward their concerns to a respective body in the form of a letter. 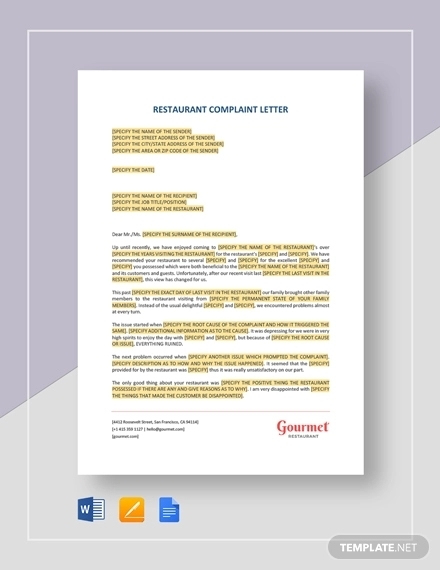 Complaint letters allow businesses to understand the needs of consumers and address any existing issues appropriately. 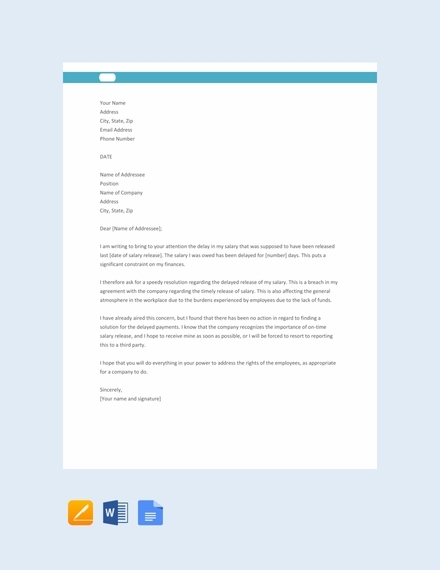 To make sure you construct a good complaint letter, learn more on the essential elements of a complaint letter and how to create one. 1. Solid Research: You’d be surprised by the number of people who have the same problems as you, most of which have openly shared their experiences online. This will help you approach the situation correctly and figure out the right wording for your complaint letter to a service provider. 2. Brief and Concise: Most emails and letters are kept short and straightforward for a good reason. Keep in mind there is a real person at the receiving end of the line, so if you end up sending a lengthy material, they’ll likely skim through most parts just to get to your main point. 3. Polite: Manners matter regardless of the case. Customer service agents tend to offer better service to customers who are cordial and grammatically correct. If you want to receive the assistance that you desperately need, spitting vile oaths and curses won’t get you anywhere. 4. Citation of Rules: Companies know better than to argue with the law. Most business agreements are printed or posted online for customers to refer to. If you find out that the company has violated a rule in their end-user licensing agreement, you could use this against them when forwarding your complaint. 5. Solution: Although companies usually have a protocol to follow when it comes to addressing complaints, solutions proposed by the complainant are often taken into consideration as well. Having a problem with a product or service can be a frustrating ordeal for most consumers. But ranting on social media isn’t going to make things better; thus, discussing your concerns with a company representative should be the first thing on your agenda. When it comes to letter writing, proper etiquette must be observed at all times. It’s important to start your letter by addressing your recipient with a simple greeting or salutation. The name of the company you are writing to along with the department and office address of the recipient should be listed as well. Don’t let your emotions get the best of you. You need to be mature enough to discuss the problem at hand and provide a proposed solution. This should be discussed clearly enough for the reader to fully understand the situation you are faced with. You can even do this through a storytelling method to paint a clearer picture of the problem. In many cases, a customer service representative would want to know when a good or service was purchased and when the problem had occurred. Apart from warranty concerns, this will also create a timeline of events to help figure out probable causes for such issue. The data collected from the report may even be used for future developments. Sometimes we like to see if we could solve the problem ourselves prior to asking for professional assistance. But if all efforts fail, writing a complaint letter should be the next option. You must identify what actions were taken to fix the problem and offer an alternative solution if both parties fail to resolve it. Let’s say the company delivered a defective package that was meant to be a gift for your grandmother’s birthday the following week. With the date fast approaching, you’d want to hear from the business as soon as possible. It’s always a good idea to ask for a quick response within a certain period. That way, customer service representatives may prioritize your concerns and have it settled just in time. A letter is important for several reasons. Not only does it put your complaint on record, but it also helps preserve any legal rights you might have in the case. This informs the company of a serious matter that must be settled before further issues arise. That being said, refer to the following tips to achieve a well-composed complaint letter. 1. Keep it clear and to the point: When forwarding an official complaint, remember to provide the necessary details that recipients should know about. In addition to the actual problem, you should also state the serial or model number of the product, the name and location of the seller, as well as the date when the item was purchased. 2. State exactly what you want done: Customer service representatives aren’t mind readers. So if you don’t want to be disappointed with their response, consider telling them what you want with a positive attitude. That way, they could easily compromise to suit your wishes or compensate for the damages made.You may also see professional letter formats. 3. Avoid writing an angry, sarcastic, or threatening message: The person reading your letter isn’t responsible for the problems caused by another employee. While it may seem tempting to express your frustrations on paper, writing an intimidating letter will do nothing but delay your case. Bear in mind that the recipient may be helpful in resolving your problem, the least you could do is be nice. 4. Attach supporting documents: If possible, include relevant documents that may support your claims. This includes a basic invoice, a work order, a payment receipt, and other similar materials. You can also send copies of emails or notes that show transaction records or previous conversations with the seller. Be sure to keep the originals just in case. 5. Include your name and contact details: In some instances, it’s a lot easier to discuss the situation by phone. But rather than waiting for a customer service representative to entertain you, you can leave your contact information in the letter for the agent to get in touch with you directly. An account number may also be necessary for immediate tracking. 1. 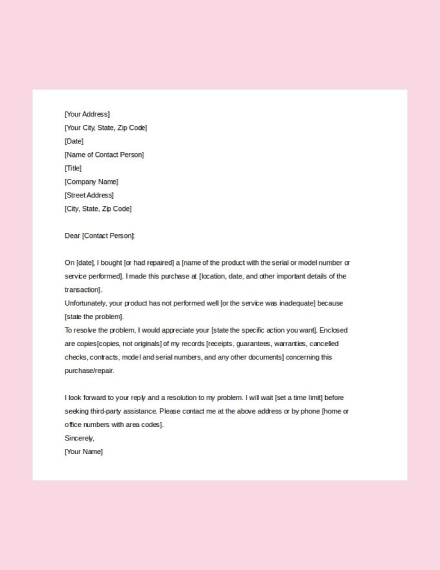 Personal Complaint Letters: This refers to the letters that are written by consumers to get a refund, replace a product, report a behavior or service, or to outline other related problems that may concern a company. 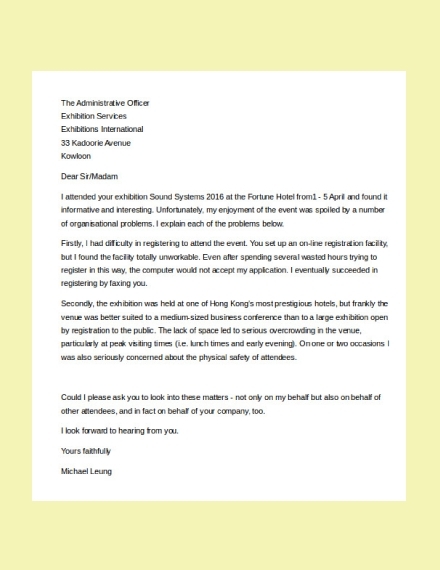 These personal-level complaint letters are also used to express grievances in regards to a service or issue affecting the individual or society at large. 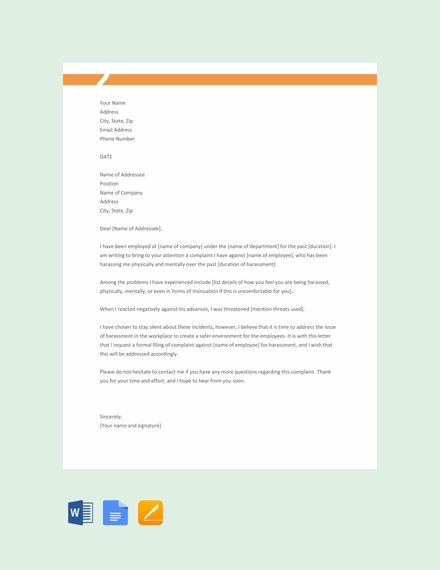 You may also see formal letter writing examples. 2. 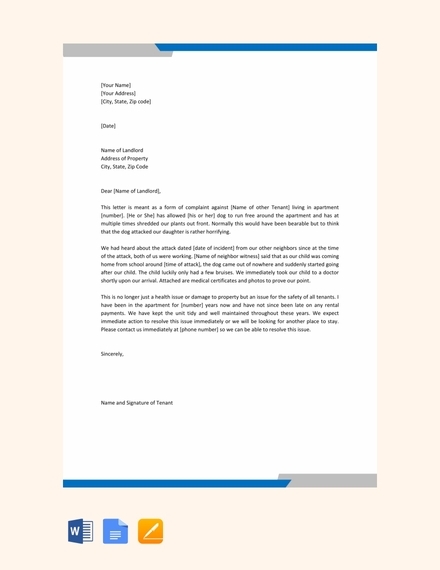 Professional Complaint Letters: When a letter is written on behalf of an organization with the purpose of forwarding a complaint to another entity, it is referred to as a professional complaint letter. These letters have the backing of an organization and are written to have problems covering professional items and services addressed immediately. Want to know about complaint letters? We’ve answered a few questions regarding this common type of letters. 1. 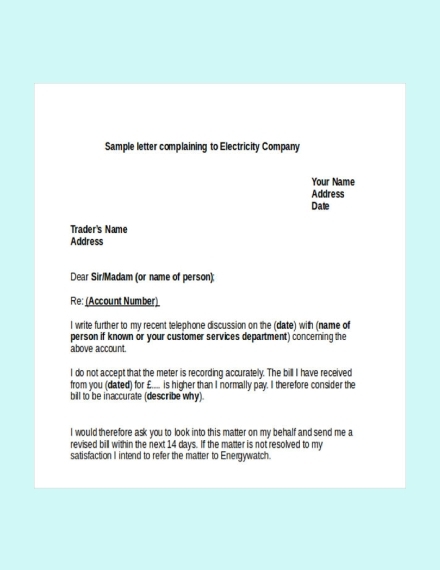 How can I make a complaint letter? 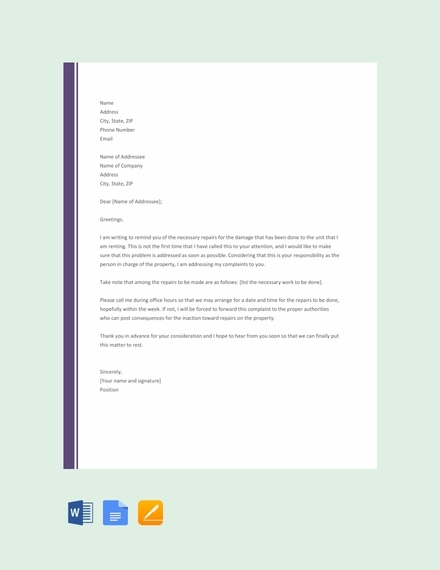 Making a complaint letter is actually a lot easier than it sounds. 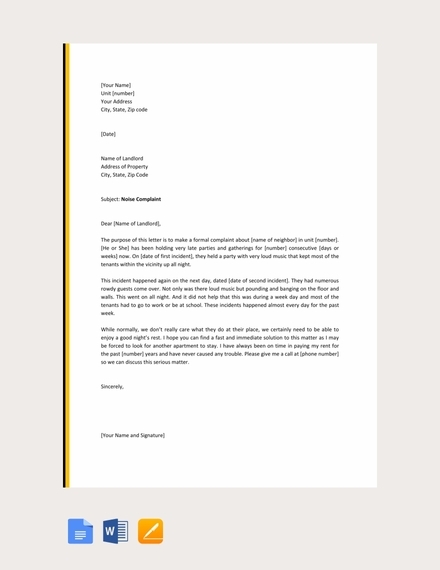 If formulating the right words for your content is your biggest hurdle, consider using a letter template to explain your thoughts. 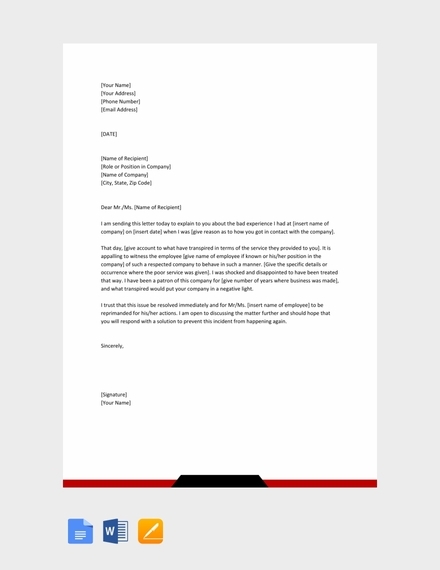 Since the situation you are in will likely vary from the one indicated in the template, don’t forget to personalize the letter to suit your exact purpose. 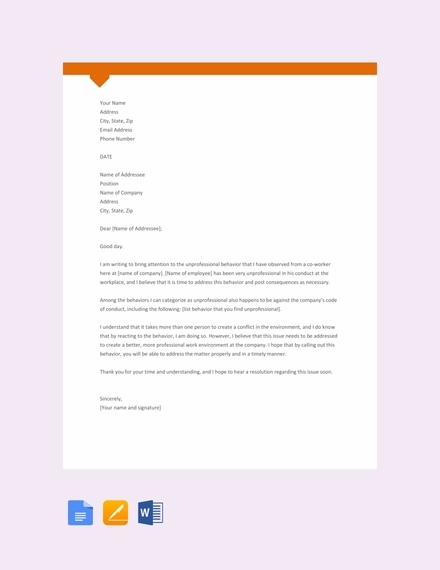 You can edit the content of the complaint letter in a program like Microsoft Word and have it printed and sent right in the nick of time. 2. 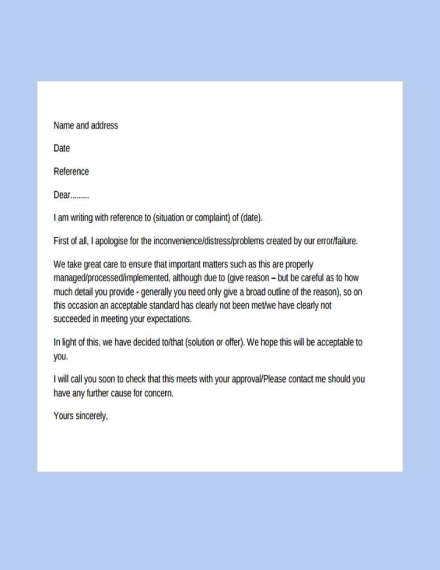 What is the purpose of a complaint letter? 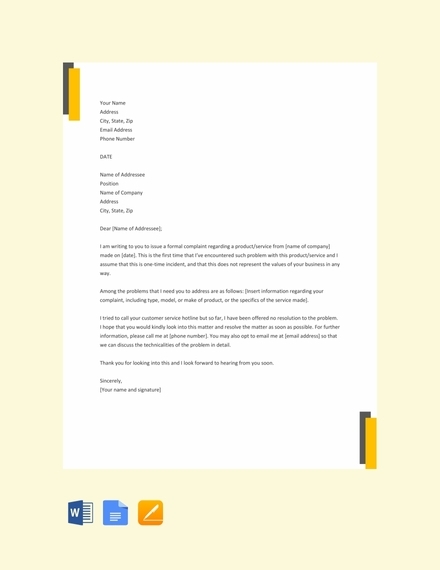 A complaint letter is a type of letter written to address some sort of wrongdoing, offense, grievance, or resentment regarding a product or service. It is also used to raise your concerns about the issue in order to seek a productive outcome. The letter is a great way to channel your pent-up emotions without sounding disrespectful. This will help the concerned authorities become more liable, responsible, and responsive toward these issues. You may also see complaint email examples. 3. 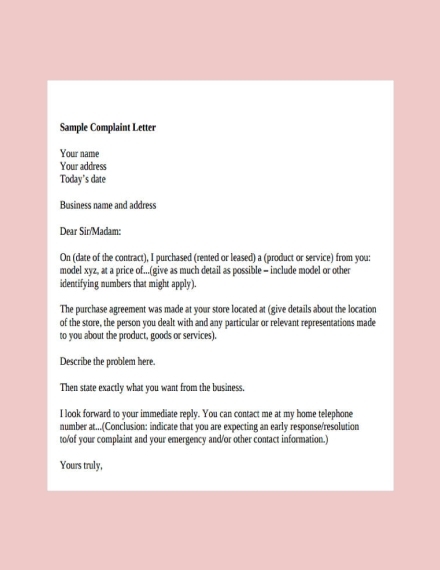 Why is a complaint letter important? Despite the various stages of quality assurance and quality control performed by a company, mistakes are bound to happen somehow. While you can never change something that has already occurred, you can take it upon yourself to make sure the same thing doesn’t happen to someone else. In most cases, sending a complaint letter is beneficial for you, the recipient, and future prospects. This documents an issue that may be reviewed and dealt with through a corrective action. Writing complaint letters is a vital responsibility of the victim whilst seeking positive outcomes from the concerned party. This informs the recipient of a particular event that had occurred, allowing them to rectify their act before the complainant pursues legal action. 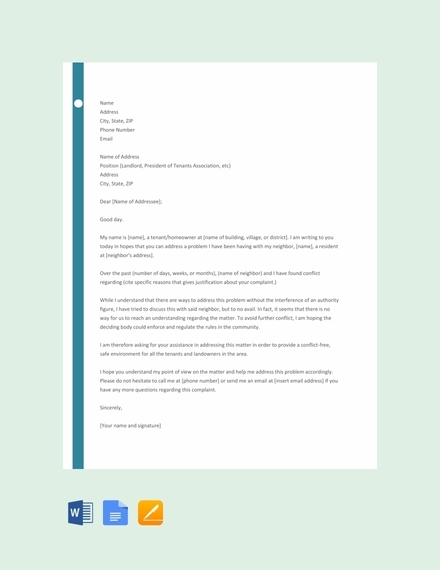 So if you ever find yourself in need of one, these complaint letter samples and templates are sure to be of great help.